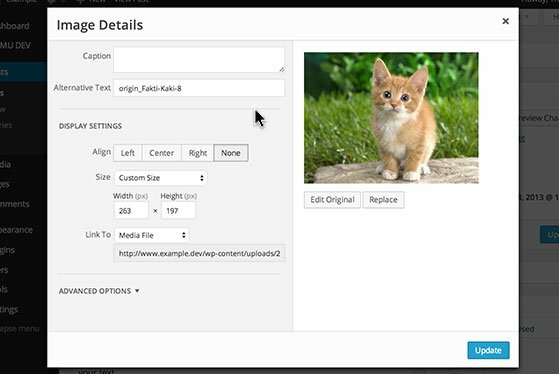 This video will introduce you to adding images to introduce your users, clients or internal staff to ‘Editing Images’ from the WordPress visual editor. The visual editor lets you make quick adjustments to images without ever leaving the Page or Post. Clicking an image inside a post or page will make it so you can scale the image by dragging the corners. Click and hold an image to move it–drag it where you want it to display and drop it in place. Grab the corner and drag to scale the image. Click the ‘Edit’ icon to open the ‘Image Dialog’ box. From here you can add or edit the image ‘Caption’ and ‘Alternative Text’. Under ‘Display Settings’ you can quickly adjust the image alignment and size. The ‘Advanced Options’ allow you to further customize the image attributes. From here you can add custom CSS and define what URL the image points to when it is clicked. Click the ‘Edit’ icon to open the ‘Image Details’ dialog box. When you are finished with your changes be sure and click ‘Update’. For more control over editing your images, use the ‘Image Editor’ in the ‘Media Library’. Make the content on your site stand out. Give your users, clients or internal staff control over how images display by sharing this ‘Editing Images’ tutorial.